1963 is a six-issue miniseries written by Alan Moore and published in 1993. Stylistically, it invokes The Silver Age of Comic Books (particularly, that of the early Marvel Comics), complete with spoof advertisements in the style of the day. This last item was repeated with a period-appropriate twist by Moore's later project with Kevin O'Neill, The League of Extraordinary Gentlemen. The series has never been finished as initially intended. It was meant to be followed by an 80-page annual, in which the 1963 characters are catapulted forward 30 years to meet with the Dark Age characters of 1993. Acid Trip Dimension: When they go through the Maybe Machine in Mystery, Inc.
Affectionate Parody: This miniseries is loaded with playful jabs at Marvel cliches. Anthology Comic: A few of the issues have more than one story. Arch Enemy: The Red Brain is the only confirmed one. Art Shift: In the last issue, when they enter the final parallel reality, complete with Lampshade Hanging. Everything's so harsh and vivid! Almighty Janitor: Or the Omniscient Maintenance Staff. Breaking the Fourth Wall: The pandimensional being the Hypernaut battles peels down the panel so the the energy bolt he fired comes back and hits him instead. Captain Ersatz: Pretty much everyone. Mystery, Inc is the Fantastic Four, the Fury is Spider-Man and Daredevil, U.S.A. is Captain America, Hypernaut is Iron Man with some Silver Surfer and Green Lantern thrown in, Horus is Thor, N-Man is the Hulk, and Johnny Beyond is Doctor Strange as a Beatnik. And those are just the main heroes. Continuity Nod: Though when they reference previous issues, most of them do not actually exist. Catch Phrase: "No one escapes the Fury!" Crossover: The characters from different superhero teams are appearing together. Deliberate Values Dissonance: The sexism, the heavy-handed anti-communism, etc. Everything's Better with Monkeys: Queep! Evil Counterpart: In the last issue. Evil Is One Big Happy Family: In the alternate universe, at least. Gosh Dang It to Heck: Goldarn the blamed thing, for cripe's sake. Hypocritical Humor: The Fury tells one of the Mooks that he hates name callers, "especially a slope-browed, knuckle-dragging, garbage-brained name caller like you!" Intentional Engrish for Funny: The spoof ad "Shamed By You English?" Legacy Character: The Fury is the son of the original Fightin' Fury. Non-Human Sidekick: The Hypernaut has a mutant pink monkey with two faces named Queep. Red Scare: A recurring theme. Shout-Out: To Watchmen and Marvel Comics. Also, when the Voidoid is scanning the Fury in Issue #2, you'll notice that in one part, the name of a certain Superman character from the fifth dimension appears in one of the panels. 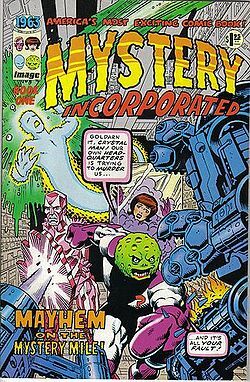 And in the final issue, when the heroes are transported into another world, panels from various other Image comics are seen in the background - including one of normalman... in reference to normalman having a Mystery, Inc cameo under similar circumstances. The N-Man can be seen reading a copy of Jack Kerouac's On the Road. Show, Don't Tell: Often Averted. Take That: Not so much to early Marvel Comics, but the people behind them; especially poking to Stan Lee. Villain Team-Up: The Voidoid talks about how he teamed up with other villains in the past. Who Shot JFK? : USA actually saves Kennedy, but the shooter was Leo Harley Osborne, who was brainwashed by the Red Brain. This page was last edited on 28 June 2016, at 23:24.